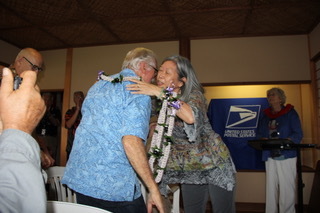 Today’s entry will share a few photographs from the stamp dedication event held at Shoroan Monday, January 23, sponsored by the USPS, County of Hawaii, and Friends of Lili`uokalani Gardens. 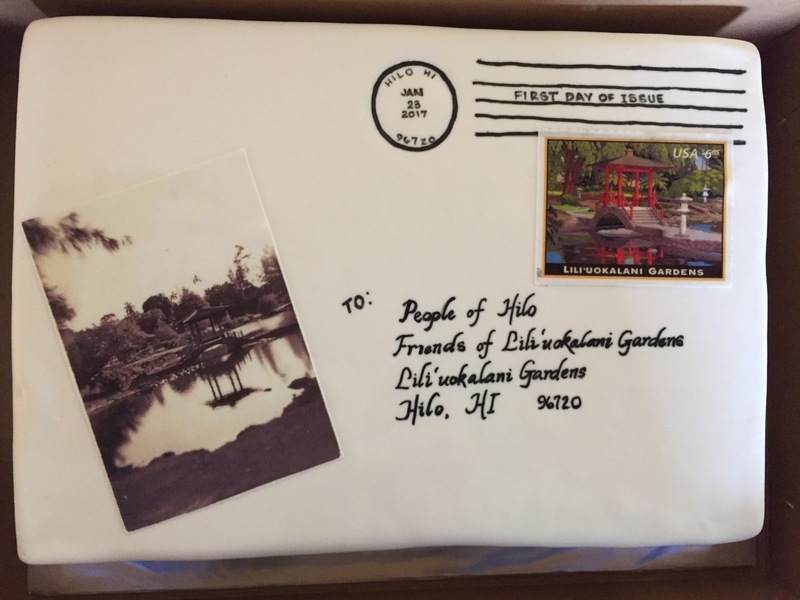 Since the official First Day of Issue was Sunday, January 22, in Kansas City, Missouri, the best we could do was make the cake into a first day cover, complete with Hilo postmark. Dedication remarks were offered by Rose Bautista on behalf of Mayor Harry Kim. 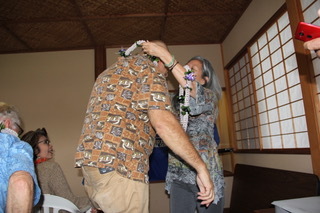 The stamp committee that made the proposal was recognized with lei from Friends of Lili`uokalani Gardens. Priority Mail stamps last until rates change. 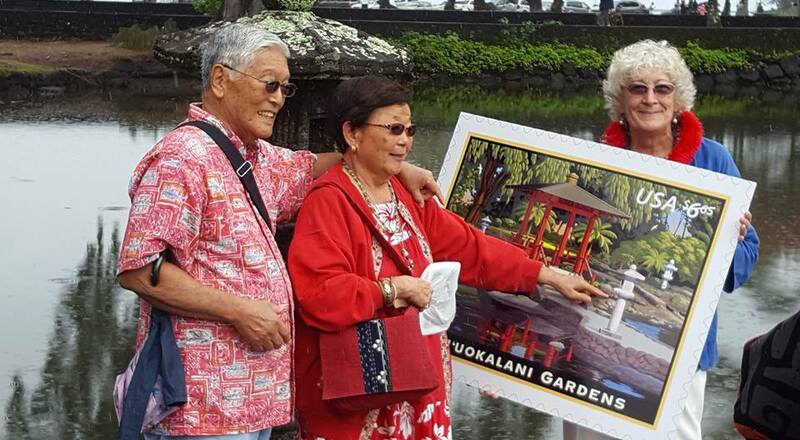 Lili`uokalani Gardens is the first Hilo locale to be featured on a U.S. stamp as well as the first Japanese-style garden to be featured on a U.S. stamp. Stamps are available at Post Offices across the nation and online. Approximately 50,000 stamp proposals are made each year, subject to review by the Citizens’ Stamp Advisory Committee. Final decision rests with the U.S. Postmaster. 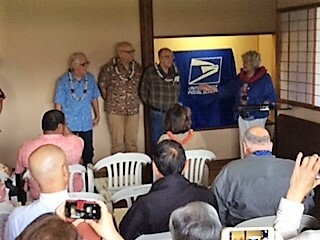 The new United States Postal Service Priority Mail postage stamp is a centennial project of Friends of Lili`uokalani Gardens four years in the making. 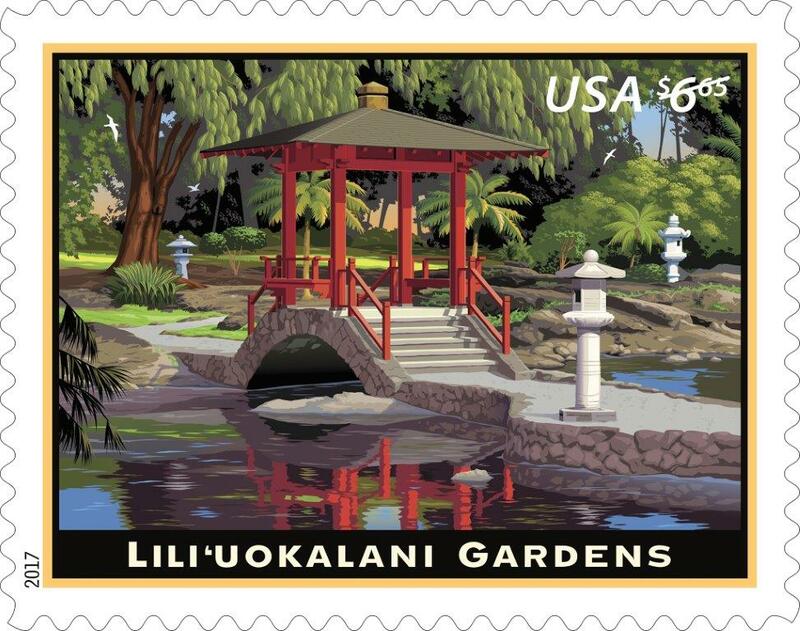 Lili`uokalani Gardens joins a select group of iconic features on the American Landmark series of Priority Mail and Express Mail stamps, which began in 2008. Previous stamps in the series include the Columbia River Gorge, Mackinac Bridge, Mount Rushmore, Hoover Dam, Old Faithful, and Grand Central Terminal to name a few. The other Hawaii image in the series was USS Arizona Memorial, an Express Mail stamp released in 2014. The Lili`uokalani Gardens Priority Mail stamp marks the centennial of the beginning of this well-known and heavily used cultural landscape. 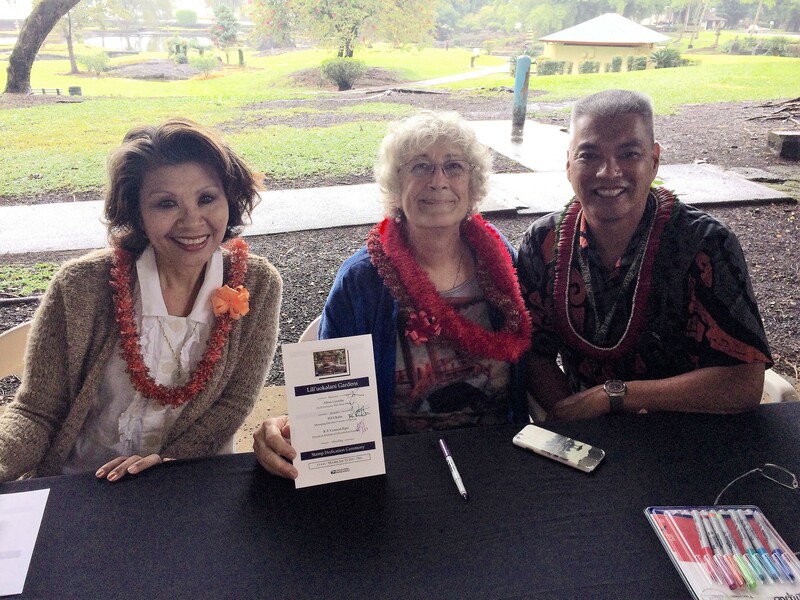 It is the first time a Hilo locale appears on a U.S. stamp and the first time a Japanese garden is featured on a U.S. stamp. Two years passed before the next word was received in August 2015 that a company was researching possible designs and wished to use one of Mr. Eger’s photographs from 2012 of the iconic red bridge and three lanterns. Detailed research behind every U.S. postage stamp issue is lengthy and precise. 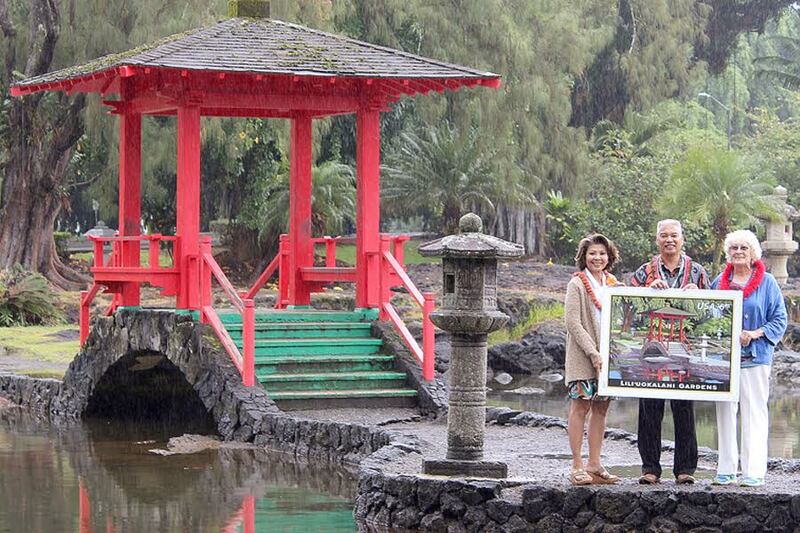 “We are grateful to one of our board members, Kenji Kuroshima, and his wife Michelle for a detailed new map of all the lanterns and monuments in Lili`uokalani Gardens,” said K.T. Cannon-Eger. 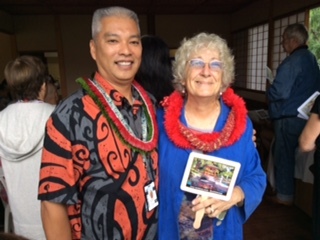 “Additional research was done with Pat Okamura and Professor Masafumi Honda at the Hawaii Japanese Center. Another board member Glenn Miyao helped locate an old map in County Parks & Recreation Department files. “This research helped answer questions from PhotoAssist Inc. such as: Where did these lanterns come from? How long have they been there? Who designed the lanterns? 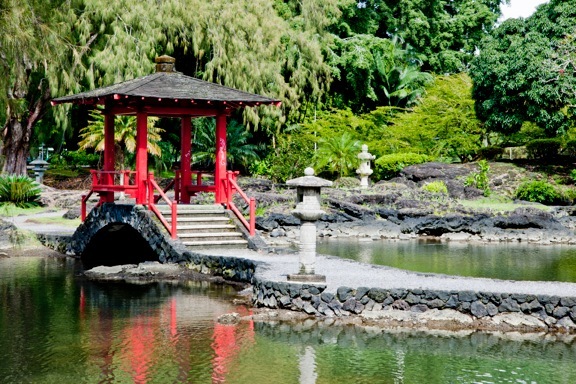 Was the red bridge shelter original to the garden? What happened in the tsunami of 1946? 1960? 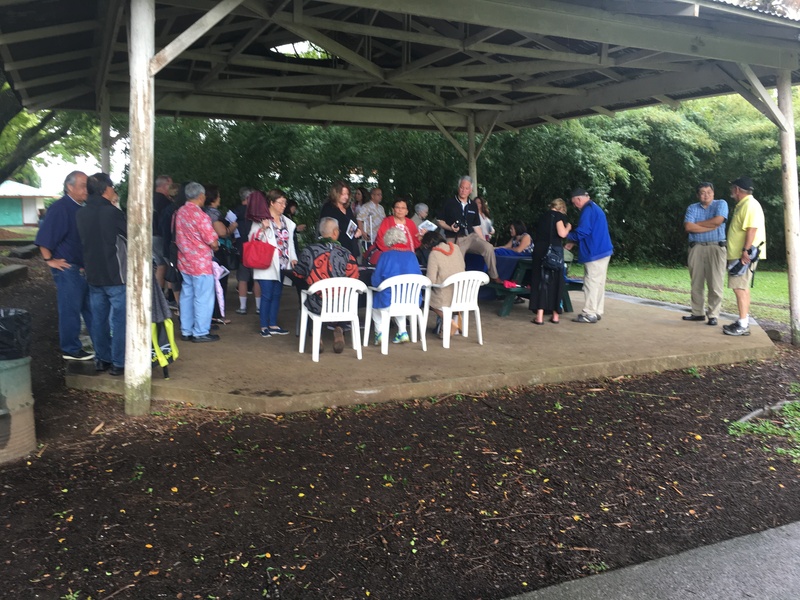 “The process of answering research questions, proofreading draft text, and providing local contact information went on nearly a year,” Cannon-Eger said. In early January, 2017, we received a phone call from Duke Gonzales of the U.S. Postal Service in Honolulu telling us the date for first release of the stamp. Planning began immediately for the dedication event Monday, January 23. Stamps are available for sale online and at Post Offices across the nation. 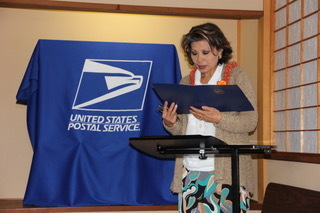 The USPS will have stamps and hand postmarking available in Lili`uokalani Gardens Monday, January 23, following dedication ceremonies. 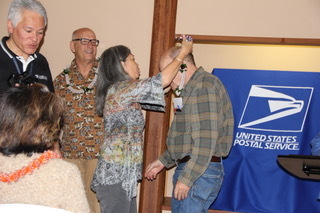 First day of issue was Sunday, January 22, 2017, in Kansas City, Missouri, for both the Lili`uokalani Gardens Priority Mail stamp and a St. Louis Arch Express Mail stamp.